Olympus has announced its oddly-named Stylus 1s, the "s" indicating it's the successor to the Stylus 1. The new model "delivers an enhanced feature set and other improvements in a similar compact, lightweight design," the company said. Those "other improvements" include a small autofocus target for more precise focusing, Step Zoom to zoom in nine preset positions, a redesigned grip and "the blue line characteristic of the i.Zuiko Digital lenses." The 1s also includes a new lithium-ion battery with "improved capacity" that's compatible with the Stylus 1 as well. The Stylus 1s was announced in Japan last October and will make its U.S. debut in mid-April, the company said, at an estimated street price of $699.99 in black. It's available for preorder now at Adorama and B&H. CENTER VALLEY, Pa. -- Olympus announces the latest camera in the compact Stylus line, the Stylus 1s. As the successor to the Stylus 1, a camera that brought photo enthusiasts brilliant image quality and a constant aperture f2.8 lens, the Stylus 1s delivers an enhanced feature set and other improvements in a similar compact, lightweight design. While maintaining all of the features of the Stylus 1, the Stylus 1s adds a variety of functions, such as Small AF Target, enabling pinpoint focusing on specific locations and Step Zoom, which provides nine preset zoom positions. 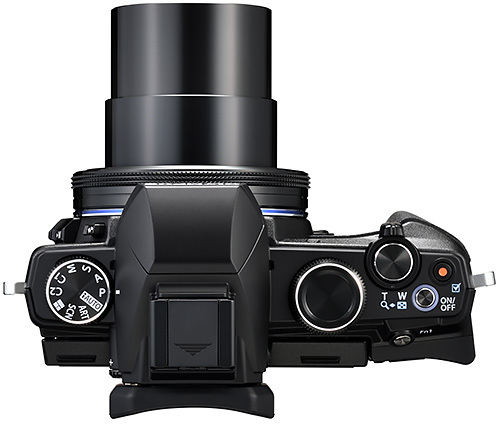 Olympus has enhanced the premium feel of the camera by redesigning the grip and also incorporating the blue line characteristic of the i.Zuiko Digital lenses. Despite its compact 2.2-inch (56.5mm) thickness and lightweight 14.2 oz. (402g) body, the Stylus 1s packs a punch with a 10.7x (28-300mm) constant aperture f2.8 i.Zuiko Digital zoom lens. This premium lens enables high shutter speeds for fast action or low light shooting environments and captures crisp details against beautifully defocused backgrounds. Olympus anti-reflective ZERO (ZUIKO Extra-low Reflection Optical) coating, assembled through multilayer film deposition technology, is applied to the surface of the lens for incredibly clear depictive performance, even in backlit and unfavorable shooting conditions. For close-up shooting, the Stylus 1s includes a Super Macro mode for capturing subjects as close as 5cm away from the end of the lens. With the combination of the wide converter lens, WCON-08x and tele conversion lens, TCON-17x, it&rsquo;s possible to shoot from an ultra-wide-angle 22.4mm to a super telephoto 510mm. The bundled BLS-50 lithium-ion battery, which is also compatible with the Stylus 1, features an improved capacity for longer shooting times. The Stylus 1s has a built-in 1.44-million-dot, high-resolution interactive LCD electronic viewfinder with a 100-percent field of view that outperforms field coverage of entry-level dSLR cameras, allowing users to preview the exposure, color and focus peaks for clear images in any condition. The EVF&rsquo;s integrated eye sensor allows users to simply look into the viewfinder to automatically switch the display from the rear monitor to the viewfinder. Adaptive Brightness Technology raises the backlight brightness when shooting in bright outdoor conditions and lowers the brightness in dark indoor conditions, reducing visual errors from light and dark adaptation of the eye. The Stylus 1s inherits an ideal blend of dedicated physical controls from the Olympus OM-D line for shooting professional quality images with ease. The Hybrid Control Ring allows users to quickly adjust settings with a simple twist of the ring without taking their eye off the subject. The subdial can be controlled with the thumb on the right hand and functions can be assigned in the same way as the Hybrid Control Ring, making it easy to apply complex adjustments. The customizable zoom lever and two function buttons further improve shooting ease and speed. Built-in WiFi is a breeze to set up. Simply tap the WiFi icon and launch the Olympus Image Share (OI.Share) smartphone app to connect. By using the smartphone as a remote control, the Live View screen can be viewed on a smartphone while remote shooting in P, A, S, M and iAUTO modes and zoom and Touch AF Shutter are available to compose and capture the shot. Recorded images may be instantly transferred to a smartphone or tablet, ideal for sharing images on social networks. Several new features found on the Stylus 1s are also available on the Stylus 1 through a firmware update. These features include Small Target AF, Focus Peaking, Interval Shooting, Time Lapse Movie, Easy Step Zoom and Switchable Zoom Factor Display. 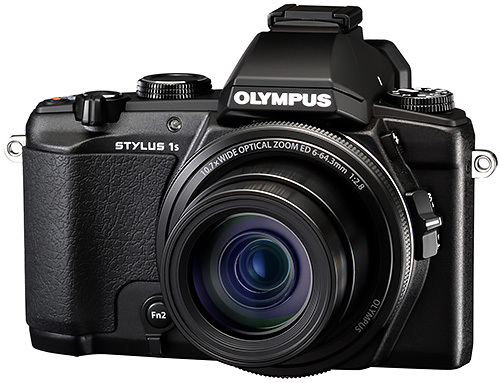 The Olympus Stylus 1s will be available in mid-April at an estimated street price of $699.99 (available in Black). For a complete list of specifications, visit the Olympus Web site: http://www.getolympus.com/us/en/digitalcameras/premium-compacts/stylus-1s.html.